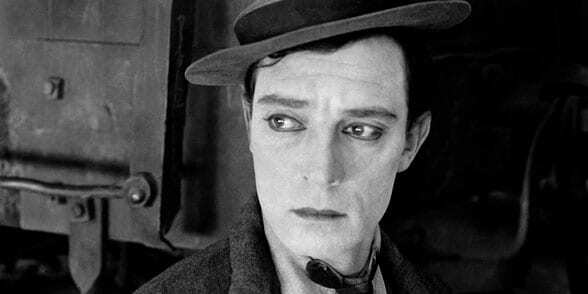 Passionate About Buster - Slapstick | Bristol's Silent Comedy Festival. As mutual admirers of the great ‘stone-face’ Ian Lavender and *Robin Ince will delight the audience telling us how they’ve been inspired by Keaton’s stunt work and comedy. This will be followed by a superb double bill of Keaton’s finest films in his homage to the great west. ‘Go West‘ (US, 1925, 68mins) and ‘The Paleface’ (US 1922, 20mins). The live score will be performed by The European Silent Screen Virtuosi featuring Guenter A. Buchwald, Frank Bockius and Romano Todesco with special guest performers Adrian Utley (Portishead). They will perform the world premiere of a new score composed by Guenter for this occasion. *Rick Wakeman has been forced, reluctantly, to withdraw from the ‘ Passionate about Buster’ event at Slapstick Festival due to a persistent case of pleurisy. Rick is deeply sorry to be unable to attend but is delighted that Robin Ince has agreed to replace him doing the onstage chat with with Ian Lavender and that Guenter A. Buchwald will be accompanying THE PALE FACE on piano in his absence. UPDATE: Robin Ince has unfortunately had to leave the festival early due to a family illness, so he won’t now be co-hosting this event. His shoes will instead be nobly filled by our very own festival director, Chris Daniels, who’ll be making his first full appearance on stage at a Slapstick! We send our best wishes to Robin and his family.